We had a great week at Loch Leven with everything pretty much going according to plan, even the sun came out! Stefan Simis, our Scientific Coordinator and Scientist at Plymouth Marine Laboratory, was happy to see that: “Although it is still early in the project, getting the sensor prototypes out in the field provided a lot of useful data, and inspiration for the teams to further their development in the upcoming months. The support which we received on site from local stakeholders really contributed to this success”. Take a look at our video diary to get a bird’s eye view of Loch Leven and see just a few of the team’s activities in Scotland. 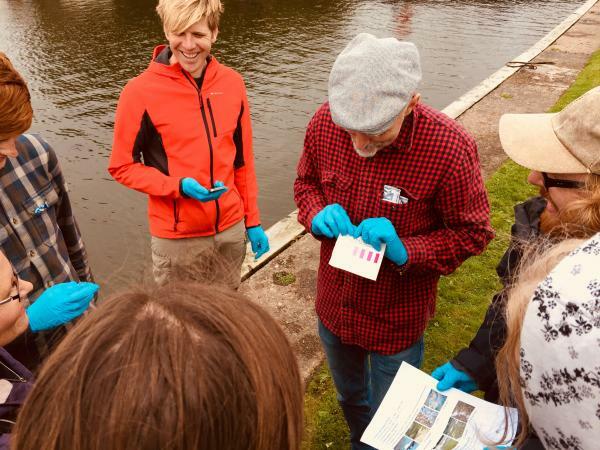 14 volunteers joined our Citizen Science programme, which brought together local people to learn some quick and easy ways to get involved with monitoring water quality in their local area. 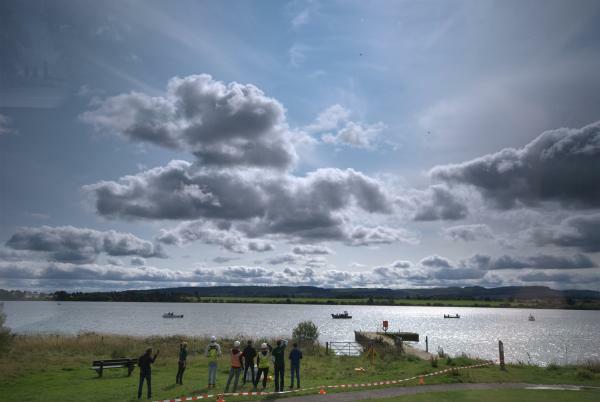 They designed and completed a pilot sampling campaign for Loch Leven, alongside Scottish Natural Heritage and National Environment Research Council (NERC) Centre for Ecology and Hydrology. Steven Loiselle from Earthwatch Europe commented: “the MONOCLE field campaign demonstrated the high potential for integrating both high and low technology in Citizen Science monitoring of Lochs”. Hear more about what Steven has to say about citizen science here. The field campaign was also an excellent opportunity to test our drone sensors. 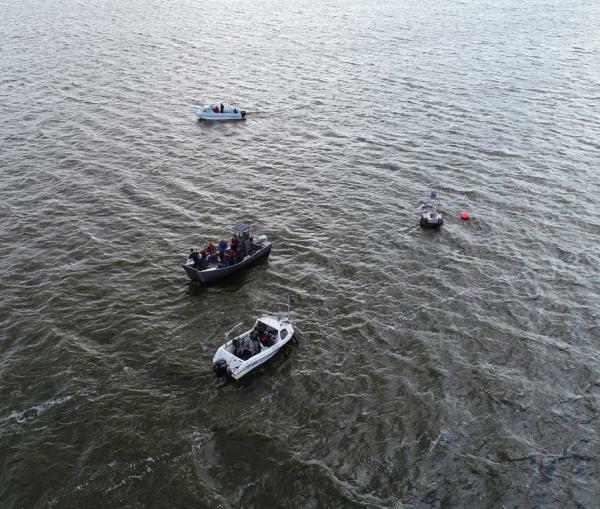 Drone pilot Stanislas van der Vaeren (of Sitemark) describes how: “One of the exercises at Loch Leven included flying with three drones simultaneously, to compare the sensors mounted on the drones, which meant we had to fly in close proximity to each other, all while keeping aligned with the boat drivers below. This was no easy feat!” To add to the complications, Loch Level is also a site with protected bird populations so that drone tests had to be carefully planned in collaboration with the land owner as well as local authorities, the nearby gliding centre and nature conservation bodies (Scottish Natural Heritage and the RSPB). Initial results confirmed that low-cost consumer drones would be able to capture relevant imagery for water quality mapping. Further tests are planned in the coming years at Lake Balaton in Hungary, lakes around Stockholm (Sweden), the Danube delta in Romania and Lake Tanganyika in Tanzania, while the team improve methods for image interpretation and sensor calibration. The team will also continue to explore how local stakeholders can interact with researchers, consultants and citizens to access relevant environmental data from low-cost devices. Thanks to Neil Mitchell from Scottish Natural Heritage, who provided fundamental support and guidance throughout the week. Thanks also to Laurence Carvalho from CEH who gave our visiting (professional and citizen) scientists a clear understanding of the historical importance of the Loch and catchment. Finally, an enormous thanks to all the local volunteers who came to participate in Citizen Science activities. Keep an eye on our website www.monocle-h2020.eu and @monocle_h2020 for updates and information about our next field campaign at Lake Balaton during the summer of 2019.